So you know I sped off to the shelter yesterday and was greeted at the office door by the wonderful, slow-wagging pointer mix that the rescue manager had told me was ideal for my family. I immediately adored her. She was confident and friendly but totally under control in her approach. She was MUCH prettier than the picture on Petfinder. White with adorable brown spots flecked all over her sweet pointy muzzle and down her back. A perfect 35 pounds, in great shape. Her eyes were a golden green. Really. I liked her vibe. A lot. I sat on the floor, picked up a toy, and started playing with her. Then I asked lots of questions to the staff. “Does she bark?” I asked. “Nope,” said the shelter manager. I grabbed her muzzle gently and lifted her lips to see how she’d respond to me checking her teeth. No pushback whatsoever. “Does she guard anything – food, toys?” I asked. “Does she have any separation issues when you guys leave?” I asked the manager. “Two minutes,” the manager answered nonchalantly, daring me to try and find something wrong with this beautiful dog. “If you had to name any complaints about her, what would you say?” I asked with raised eyebrows. Now I was sitting on the floor petting the sweet dog, really starting to fall in love with the idea of her joining my family. “Someone already has a hold on her,” the manager replied. My heart sunk in my chest. “Oh… … why didn’t you tell me that before I fell in love with her?” I sighed. I didn’t hide my disappointment. I took a few deep breaths as I continued playing with the dog. I quickly began the process of reeling back the invisible tendrils of attachment that had already started to reach out from my heart and hug this dog into my life. Sitting on the floor, I had my face right in front of her nose, eye-to-eye. “She’ll give you a kiss if you ask for it,” the manager said. I stood up and half-jokingly told the manager to talk the other guy and his wife out of adopting this precious dog. Then I gave her all my info and said to update me as soon as she knows. There is real evidence to support that dogs truly do have a natural power to connect with humans, draw them in, create a bond. But the science of that is for another day. I’m running out the door to visit a shelter. I just hung up with a woman there who told me she has a dog that could be a great fit for my family. 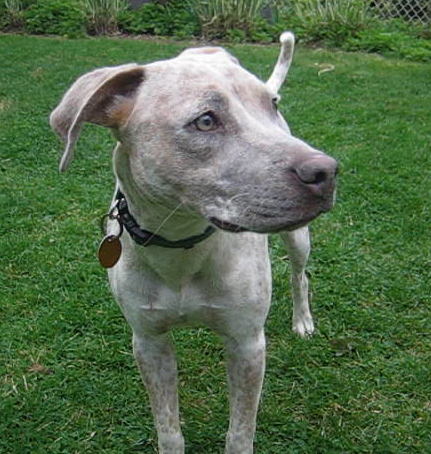 A medium-small yellow lab-pointer mix with a super sweet disposition. A persona that might fit right in with my 20-month old son. The description SOUNDS great but I have to see her and do my own eval. Which I will right after I speed over there in my car. This is one of the very first rescue dogs I am looking at. I should be very practical and calm right now, but I’m not. I’m excited, wide-eyed, and hopeful. A pro trainer shouldn’t be this vulnerable. But I’m human.